The other day I read that they named a Himalayan thrush after Dr. Salim Ali, the 'Bird Man of India.' The better part of my childhood was spent cultivating a happy interest in birding. The interest still lingers, but it has been long since it has greeted the break of dawn and the flutter of the early risers. I remember one of the nature camps I attended when I was about eight. One of the introductory activities was talking about a topic you were assigned. My piece of paper had said, 'Salim Ali,' and I had been all ready - speaking not only about his contribution to birding, but cool stray facts, like his love for motorcycles. Salim Ali is a name that even the most amateur Indian bird-watchers have heard of. It is the name on the book most of us lug around on our weekend expeditions, tucked away between a bottle of water and a pair of binoculars. And with the name goes a skeleton of a creation-story - of a little boy who shot a sparrow, only to discover on closer inspection that it was not the usual sparrow at all. It had a yellow throat. The first spark of curiosity stoked a fire of passion within that boy who would grow up to be India's greatest ornithologist. This book is about that first sparrow and the ordinary boy from Bombay who carved himself an extraordinary life. 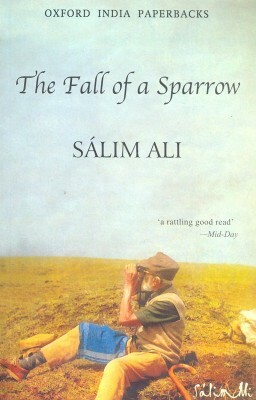 The Fall of a Sparrow is Dr. Ali's autobiography. There is much to be said about Ali's rigorous effort, his attention to detail, his broad goals and the impeccable vision that made him bring leaping reform to the way birds were studied in India. The perfect demonstration of his skill and dedication comes through in how he organized and carried out the Hyderabad State Ornithological Survey. It is impossible to mention all his work in one review, but suffice to say, it leaves you awed and inspired. An India Today review calls it "a story of the evolution of a bird hunter into a bird watcher." That implies some sort of redemption which is far from the truth. One of the crucial aspects of this book is his unique perspective on conservation. Ali condemned the encouraging 'ahinsa' approach to wildlife conservation, which he considered akin to protesting the slaughter of the holy cow. Appealing to the religious sentiment in the effort to conservation was to him misguided and futile. He was not religious or spiritual. His love for animals was not of a sentimental variety, rather scientific and aesthetic. Towards the end of the book is an interesting chapter titled Scientific Ornithology and Shikar. Ali's life work involved him killing and stuffing hundreds and thousands of bird "specimens" with innovative entrapments that he describes in the book. His methods of bird-study may seem cruel to a modern reader but they paved the way for decades of ground-breaking research in ornithology. Had it not been for his methodical study, we would not have had the knowledge we use for conservation today. These methods are employed by poachers for illegal activities. Ali goes even so far as to state that the presence of a legitimate professional shooter is the most effective deterrent to the poacher, and criticizes the statutory ban on all hunting. An excellent perspective, but I doubt it is always as simple to draw a line between the two. Now, all this says nothing about his merit as a scientist, but the fact that he would enjoy killing helpless creatures while ignoring what he admits was the prick of conscience, is somewhat unsettling. One surprising thing I learnt from the book is that Salim Ali was not a kind man, not in the conventional sense. The age old saying goes, you can judge a man by how he treats animals or servants. Salim Ali performs poorly on both counts. Example 1: He once got a servant harshly beaten for alerting him not to take pictures of a religious establishment. Example 2: On a trek in the Himalayas, Ali came across a lost pilgrim family. When they asked Ali for help, he refused, with what was some truly derisive humour, because they should have known better what they were getting into. Example 3: Ali mentions a stray dog who would sneak into his house and mess up his field notes, till Ali shot him dead, "with no regret whatsoever." He did not let politics affect his relations with either his Indian friends or the English. British India from his perspective is fascinating. He talks about Sarojini Naidu's sense of humour and how she would refer to Gandhiji as Mickey Mouse, which he accepted as a compliment "with lighthearted toothless gaiety." A whole chapter is dedicated to his favourite brother who was a District Magistrate. And another to Loke Wan Tho, a Singaporean businessman-turned-ornithologist who might well be the most interesting person in the book. Ali proudly mentions how Nehru gifted his book to Indira Gandhi, who recommended it to a US Senator, who then nominated Ali for an award that is like the Nobel prize for ornithologists. Needless to say, he won it. He talks about his achievements with an almost surprised pride, which makes him sound astonishingly humble. Even as I write this review, I am reminded of a quote I keep quoting from The Uncommon Reader by Alan Bennett, about how writers can be wholly different from their books. This is not exactly the same, but even so, it is a case of discovering what your childhood hero was really like, stacking achievements alongside failings, and loving him for all of them. A crazy, beautiful read - is how I would sum it up. The Fall of a Sparrow has been on my wishlist for a long while and it was entirely worth my time. My spoken Hindi is shaky at best. But I can read Hindi fairly fluently, one reason being that it shares its script, called Devanagari, with my mother tongue. 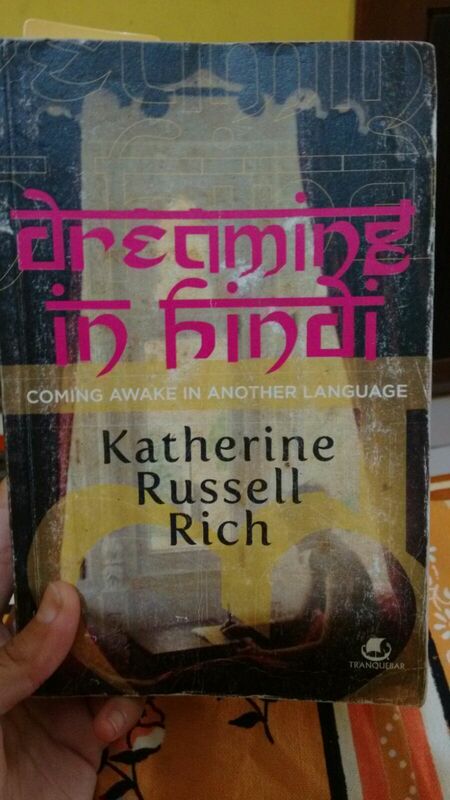 A little detail I love about the cover of Dreaming in Hindi is how the title of the book is fashioned to look like Devanagari, squiggly letters with a line running across the top. One of the harder aspects of learning Hindi for an English-native must be this script, which unlike English, is perfectly phonetic and has no letters for vowels. We add additional markers on each consonant letter for any following vowel sounds and consonant clusters. So the name Priya consists only of two letters (प्रि and या) in Hindi - a fact that must take a while to wrap your head around. We in turn find it difficult to make sense of all the vocalic variations in English and spend long hours scratching our heads over why the word lose sounds no different from loose... I digress. Dreaming in Hindi: Coming Awake in Another Language by Katherine Russell Rich is a book for language lovers by a language learner. Which makes it basically, very subjectively, the best kind of book. Having recovered from a long cancer treatment, American journalist Kathy Rich finds herself wanting to escape. And in what I have been told is a rather Eat, Pray, Love-esque way, sets out to remote India on a freelance writing assignment. A Hindi learning course takes her to Udaipur, a small city in the desert of Rajasthan. Kathy describes it as exactly the sort of exotic mess that the word India would bring to mind - dust and scorching heat, women in billowing sarees, lavish palaces, narrow streets, and minds steeped in old tradition. Dreaming in Hindi follows Kathy's experience of learning by-immersion a strange foreign tongue, the struggle to make meaning when thrust into a new reality, the myriad misunderstandings it leads to, the peculiarities of the Hindi classroom, the cultural demands from a white woman in semi-rural India. Kathy's accounts also describe the political situation in the country, beginning with the aftermath of the 9/11 attack, which happens shortly after her arrival in India. Nearly a year later, even as she exchanges emails with her American friends about the tragedy, the India around her is cocooned in its own suffering, with many instances of communal violence leading up to the 2002 riots in Gujarat... it is a book that teaches vital lessons in empathy. But this is not a travelogue, Kathy never quite embraces the new. She frequently turns into a carping critic of everything Indian; not once acknowledging it as a natural result of culture shock. Many, many characters populate Kathy's accounts, much like they do the country. Kathy resorts to calling people by descriptors - the Whisperer, Dad 1, Dad 2. She mostly keeps to herself, and despite having lived in a home-stay for fairly long, leaves with hardly any insight into the middle-class Indian mind. Towards the end of the book, even as she waxes eloquent about how she misses Hindi back home, it is difficult to understand what, if anything, she actually liked about it. She is funny, I'll give her that. But her constant acerbic remarks about her peers are petty and take a while to get used to. The best moments are when Kathy becomes obsessed with the Bollywood movie Lekin, the time she spends volunteering at a school for the deaf and hearing impaired, learning sign languages, her doctor's visits, and her interactions with the Hindi poet Nand Chaturvedi. Such times, when she castes aside her reckless judgement or learns better, are worth it. Miracles are limited by place. "If you smile, you heal faster," Dr Aggarwal told the uterine cancer patient, but away from her room, in the dim scruffy hall, he said simply, "If you get cancer here, you die." And her? Too advanced, he said matter-of-factly. He brightened. "To you make a patient smile, you make them healthy," he chimed. So cruel, I thought, breathless with anger, then I saw. That's all he had. All he had were words. She intersperses her anecdotes with conversations and consultations she later had with various linguists, academics, pedagogues about language acquisition. It is cool how many sociolinguists cite this book as a good perspective on language learning (most recently I saw it in a book by applied-linguist Vivian Cook.) Kathy also details the most basic theories of language science and its history, throws us interesting tidbits she learns along the way - like how sign languages have dialects, or how you can be dyslexic in one language and not another, and so on... things which, as a Linguistics student, I know and have studied, but are pretty cool either way. Foreign language studies are a rigged operation, I learned. An estimated 95 percent of students "fossilize," the linguistic term for hardening at a certain level. Ninety-five! So accent's a given, perfection's impossible, and odds are you're on your way to becoming a linguistic fossil: good work. At some point, then, the question has to become, Why would you even try? In Hindi, you drink a cigarette, night spreads, you eat a beating. You eat the sun. "Dhoop khana?" I asked Gabriella Ilieva, a moonlighting New York University Hindi professor, first time we hit the phrase. "Sunbathe," she said smiling. "To bask in the sun." My mind, alert for ricocheting syntax, was momentarily diverted by the poetry of idiom, the found lyricism that's the short-form answer to the question of why you'd try.